Like any piece of furniture, dust your blinds regularly. Use an ordinary soft, clean cloth, chemically-treated dust cloth, dusting mitt, vacuum cleaner with brush attachment or cylindrical dust brushes especially designed for blinds. The paint surface of the slats is smooth and dust is easily brushed off, when dusted during regular cleaning. Lower the blind to its full length, then tilt the slats almost fully closed and dust. Then do the reverse side of the slats in the same manner. In order to reach the dust where the slats overlap, it is best not to fully close the blind in either position. Most of the cellular shades, like the Hunter Douglas Duette shade, are anti-static, and they require very little cleaning. A light sweep with your vacuum cleaner brush attachment is all that is needed to keep them dust free. For a more thorough cleaning, the entire shade assembly may be gently wiped with a soft damp cloth using lukewarm (not hot) water. Take special care when handling opaque (blackout) shades to avoid creasing, and do not immerse them in water. For tough stains, spot clean with Clean-n-Brite. Be very careful when trying to clean soft shade types of shades as they tend to "pill". Vinyl vertical blinds should be dusted on a regular basis as aluminum. Vinyl type usually (use caution!) can be "soft scrubbed" with a Clean-n-Brite to remove difficult stains. Fabric verticals unless expressed can not be washed. A regular vacuuming is all that is necessary, with a stubborn spot you may damp wipe the fabric using Clean-n-Brite. Fabric inserted verticals follow the same instructions for care for fabric, the backs however can be vinyl cleaned using Clean-n-Brite. 1. Release the blinds so that all slats are exposed. 2. Close the blinds so that the slats all face one direction. 3. Wipe with a damp rag. 4. Close the blinds in the opposite direction and wipe them again. 1. Remove the blinds from the window. 2. Release the blinds completely and lay them down outside, on top of a drop cloth. 3. 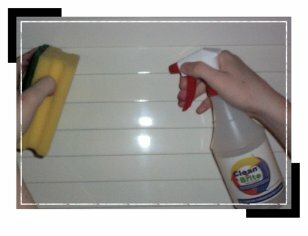 Spray blinds with Clean-n-Brite cleaner. Allow cleaner to sit for a few minutes. 4. Scrub the blinds gently with a soft-bristled brush in a motion parallel to the slats. 5. Turn the blinds over and repeat this process. 6. Hang or hold up the blinds and rinse with a hose. 7. Shake as much moisture from the blinds as possible. 8. Hang the blinds outside and allow to dry. Cloth-covered blinds should be vacuumed regularly and cleaned every two years.